I just wanted to take a break from packing to get a blog post squeezed in. 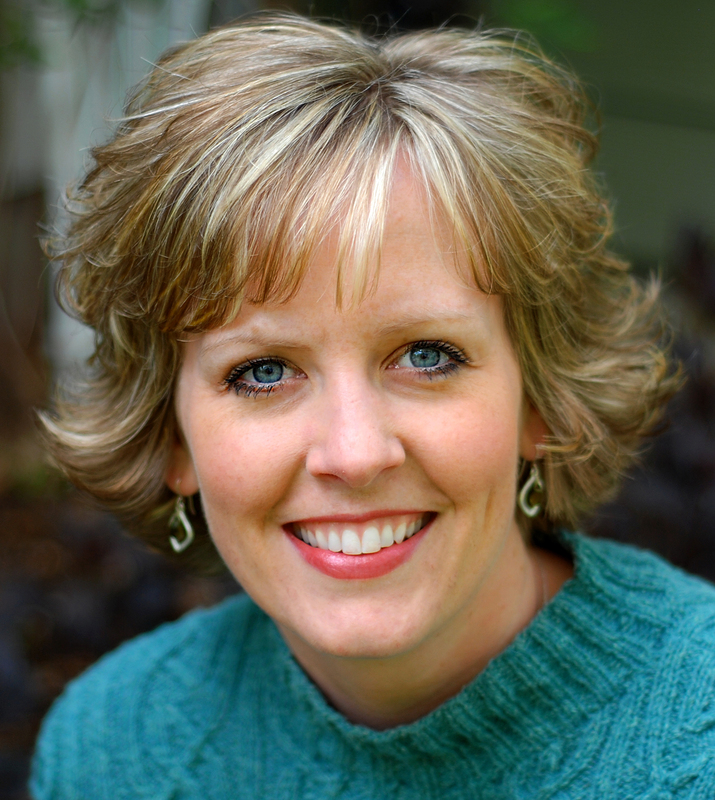 I’m leaving to teach a retreat this weekend at Lake Beauty Bible Camp, so that is what I am packing for. Hopefully I will see some of you there! In the meantime I have a couple of things that I have finished up lately. First up, is this cute panel made from the fabric line “Frolic” by Sandy Gervais. My sister is helping to redecorate their church nursery and this little quilt is going to hang in the sleeping room. She did the assembly and asked me to quilt it for her. This picture shows the quilting better. She asked for something simple, but I just couldn’t bring myself to meander this one. There are so many places to do some fun things! As you can see, I tried to bring out the details in the panel. While I was working on this quilt, I just fell in love with this fabric line. I mean, just look at that great stripe for the binding! You know how I love stripes. I now have this fabric in my stash. Now, I just have to figure out a project. If you are interested in this panel or fabric, I got mine at the Flying Goose Quilt Shop in New London, MN. There number is 320-354-3535, if you need some for your stash too! This little guy dropped in while I was taking these photos. He looks right at home with this quilt! 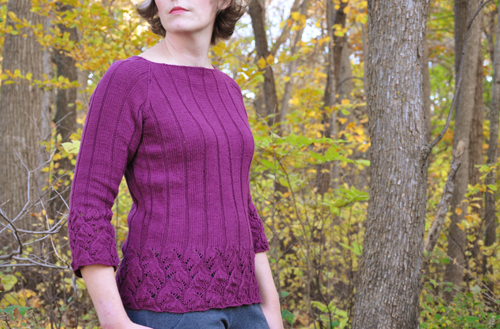 The pattern is the Chinese Lace Pullover by Angela Hahn. The pattern is well written and very easy to follow. I’m working on another one of her patterns too, but I have a ways to go yet to finish it. I also love the color of this yarn (Creative Focus Linen by Nashua Handknits.) The color is so rich and has just enough red with the purple to really warm up the color. It’s always so much fun to finish something. I don’t know why, but I think I love completing projects even more than I like starting new ones. There is always so much to do and somehow I can’t be at rest unless something is finished. The problem is, I have a long line of project that are just waiting for me to cast on . . . . so the cycle continues! How about you? Do you prefer starting or finishing? This entry was posted in Knitting, Machine Quilting, Quilting and tagged Chinese Lace Pullover, Frolic. Bookmark the permalink. Beautiful sweater, excellent knitting, my favorite color. This little quilt is absolutely wonderful!! I love it!!! 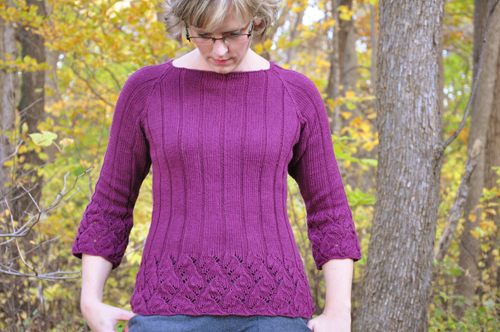 and your pullover looks great, I love the lace design too. Have a lovely weekend! I made a quilt using this panel, too – it really is a fun one to quilt! And I am in awe of your knitting skills, love your beautiful sweaters. The quilt is fabulous. 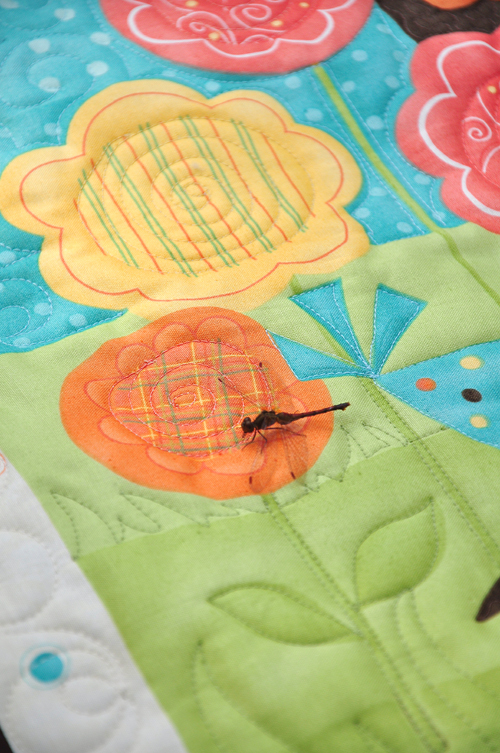 I love the fabric, but your quilting is so beautiful — it just enhances the panel design. And I am so in awe too of your knitting skills — I saw all the sweaters you have knitted on Ravelry and they are all beautiful. You are so talented!! I love the quilting. The details are amazing, and as you hoped, truly enhance the panel. I love your knitting. My mother has knitted all my life, and it is fun to see skills like that still ongoing in the world. You knit beautiful things beautifully. I love the way you quilted the panel, it is sweet! Very cute panel quilt. Do you have a long-arm machine that you use to do the quilting or do you do it on a sewing machine? I hope the answer is that you do it on a sewing machine because I’m always looking for new designs that I can do on my sewing machine. I am so impressed with your knitting skills. It’s not something I’ve ever been able to master. 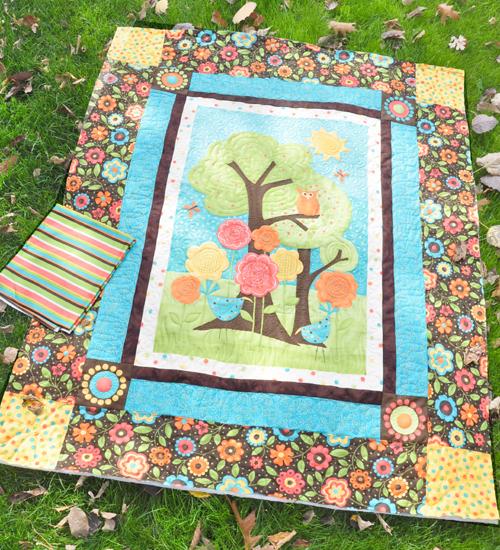 The quilt panel is a darling nursery quilt! Such detail in the quilting to make it pop! OK…YOU are such a fast knitter!!!! I am new to knitting, and cannot even imagine making a garment. It is still scarves and dishcloths right now. But I am also working on two afghans! I do love the knit and crochet!! Your sweater is beautiful! 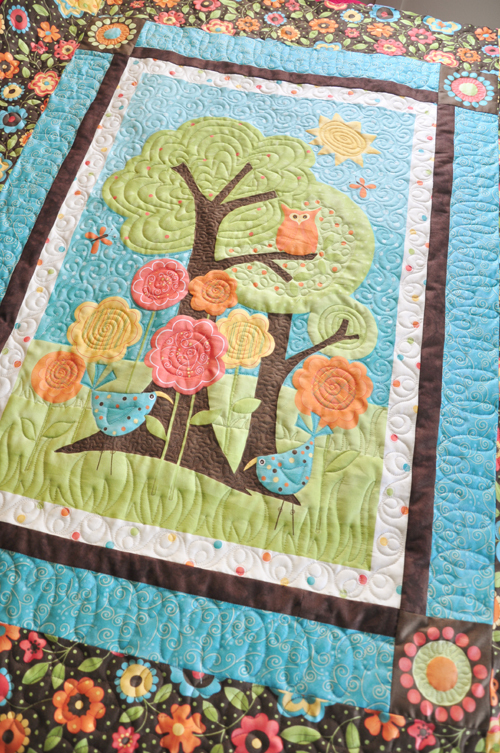 The quilting on the nursery quilt is great! I definitely love finishing a project. It takes me a while to complete anything, so finishing is always a big deal for me. Starting is fun, too, because I have something to look forward to finishing. Gorgeous sweater!!! I have loved that pattern for some time and then just remembered that I actually started that pattern…LOL!! Love it in that color though. Great job! super cute…hope you got the invite with karas pic! your sweater is just beautiful! i love the little quilt. you did an amazing job quilting it. i, too, prefer finishing projects….but then i do love to start new projects. i guess i just love the whole process 🙂 i’m sorry i can’t make it to lake beauty anymore. maybe next year i can make the drive there and pop in just to see you! Great sweater! I love finishing if I’m liking the results. 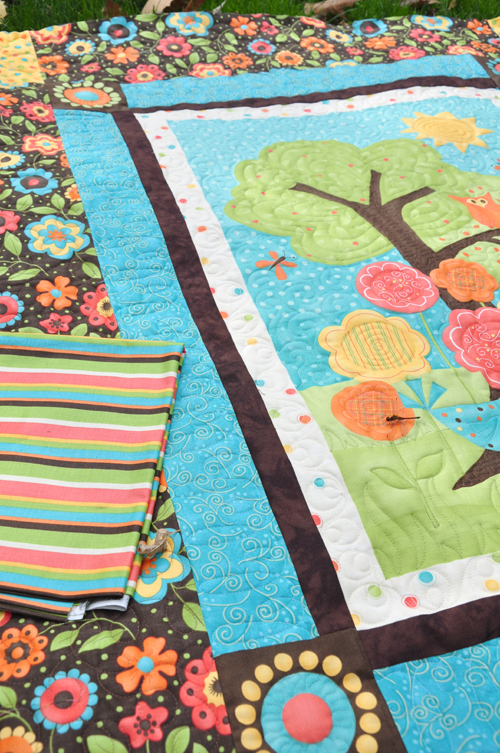 Your quilting really is the perfect addition to the quilt. And your sister did a great job of construction. It will be a lovely spot in the nursery. 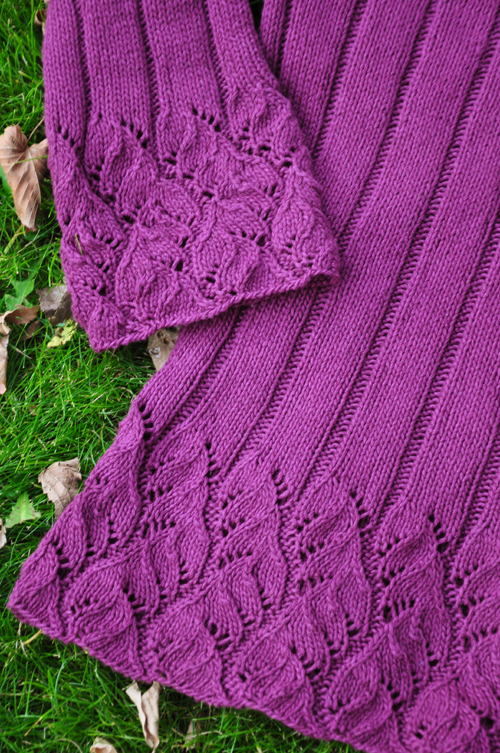 And your knitting leaves me awestruck! I don’t think I’m that consistent with my tension. Beautiful! Just love the quilting! It’s perfect! It’s fun to start something new, but there’s something so gratifying about actually finishing a project! I was also going to Lake Beauty when you are scheduled to be there. However, something came up and I had to back out of it. Hope you have a great time! Starting or finishing? Both! I’m just not a multi-project kind of person. One quilt, one painting at the same time is okay but not two quilts or two paintings. I guess I’m what’s called goal oriented. How fast do you knit? Or do you European knit? The sweater is beautiful as are all of them you’ve posted. And I love the little quilt. I’m so glad you didn’t just meander. That’s what I don’t like about machine quilting! This, though, is really pretty. What a beautiful sweater, lovely workmanship! Wonderful knitting skills. That is something I would like to try out. I am very impressed at both you knitting and quilting skills. 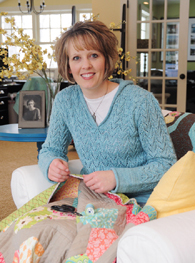 That fabric line is adorable – Sandy does do some pretty fun stuff! You have quilted beautifully, and I know the nursery will be sweet and relaxing! You know I love all your knitted projects – they are beautiful, as you are.